Green Lights Recycling – We recycle lights, electronics, mercury waste, batteries, computers and more. Based in Minnesota USA, GLR adheres to the highest regulatory standards in the nation. Since 1995 we've maintained a proven track record for responsible recycling and have kept over 96 million pounds of waste out of landfills. Our goal is to keep over 100 million pounds of waste out of landfills by 2020. Contact us to find out how we can help you reach your recycling goals. We recycle lights, electronics, mercury waste, batteries, computers and more. Green Lights Recycling, Inc (GLR) has been providing recycling services throughout The Continental United States for its customers. Recycling services have grown since the company’s inception. GLR got its start recycling fluorescent lamps and High Intensity Discharge (HID) Lamps. The HID Lamps include High Pressure Sodium, Metal Halide, Mercury Vapor and Low Pressure Sodium Lamps. GLR recycles older PCB Ballasts and newer Electronic Ballasts. The company has grown and expanded steadily. GLR is based in Minnesota where the recycling process is done. GLR owns the equipment necessary to convert the otherwise hazardous waste into re-usable commodity grade goods. Materials such as glass, metal end caps, brass tips, phosphorous powder and even elemental mercury are reclaimed. From sophisticated entry locks to strategically located closed-circuit monitors at our locations, your security is our priority 24/7. Destruction services are provided for hard-drives, tape, optical media, other proprietary components and document destruction. Each individual lot is accompanied by a Certificate of Recycling. All materials are recycled in accordance with local, state & federal guidelines. Green Lights Recycling has won numerous local and state awards for operating an exemplary recycling operation. Our client base includes numerous Fortune 500 Companies, Small, Medium and Large Businesses, Governments and Municipalities. We are confident you will agree with them, Green Lights Recycling is your one-stop-shop for Special Waste recycling needs. E-waste is the most rapidly growing segment of the municipal solid waste stream. E-waste contains many valuable, recoverable materials such as aluminum, copper, gold, silver, plastics, and ferrous metals. In order to conserve natural resources and the energy needed to produce new electronic equipment from virgin resources, electronic equipment can be refurbished, reused, and recycled instead of being land-filled. E-waste also contains toxic and hazardous materials including mercury, lead, cadmium, beryllium, chromium, and chemical flame retardants, which have the potential to leach into our soil and water. Green Lights Recycling turns your sensitive paperwork into confetti-sized pieces giving you peace of mind knowing your confidential documents can't be reproduced or recreated. Whether you have a regular service program or are simply performing an annual clean-out, you can be assured your information will be securely destroyed by the experts in the information security industry. We ensure the secure disposal of your confidential information while helping you stay compliant with stringent privacy laws. Documents should be destroyed that contain the following: Telephone Numbers, Driver’s License Numbers, Passport Numbers, Individual Education Files, Credit Card Numbers, Bank Account Information, Addresses, Social Security Numbers, Insurance Policy Data, Employment Information, Debit Card Numbers and so much more! Complete Hard Drive Destruction HIPAA and FACTA compliant. Click Here for additional HIPAA and FACTA information. 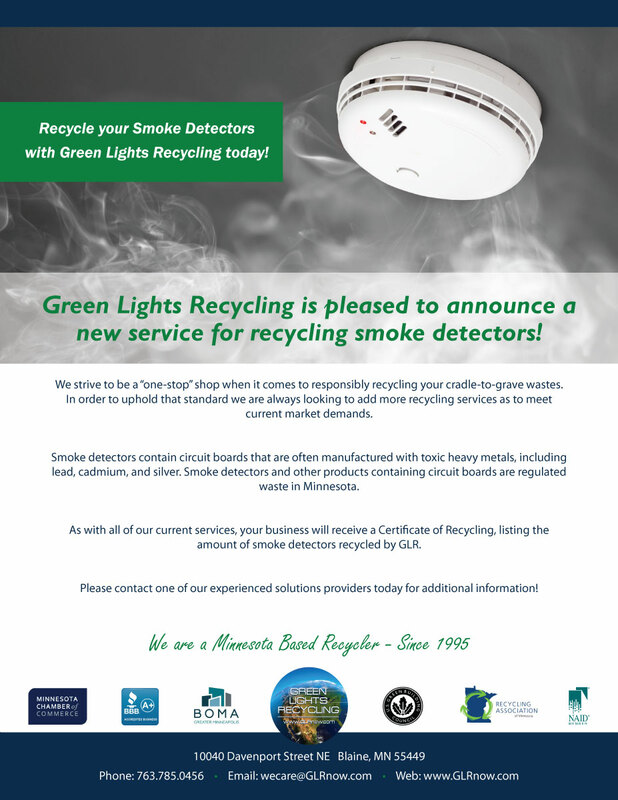 Green Lights Recycling is pleased to announce two new services for computer hard drive destruction. We have always guaranteed computer hard drive destruction as a part of our services. Recently, we added two new in-house machines to expand our service offering and capabilities. The two machines are called the “Enforcer 12,000” and the “Nemesis 480”. The Enforcer 12,000 is portable and can be used at customer locations for on-site hard drive destruction which is HIPAA and FACTA compliant. The Nemesis 480 is a stationary hard drive shredder. 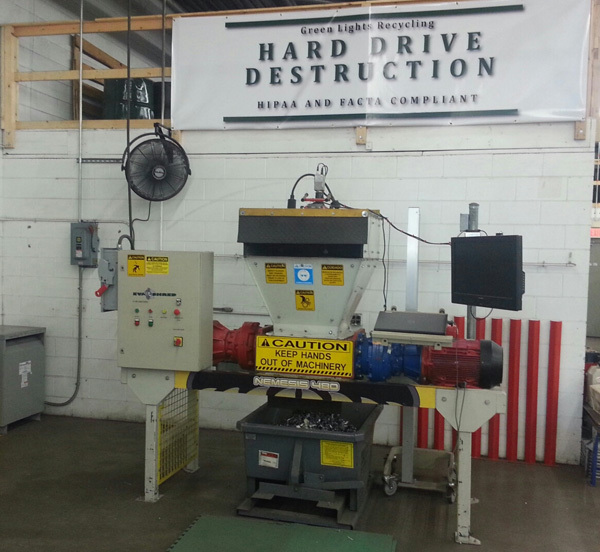 Intact hard drives are fed into the machine and they are completely shredded. Green Lights Recycling knows that confidential data destruction is imperative and these new machines allow us to ensure that confidential data is completely destroyed. Since 1995, Green Lights Recycling has been protecting our environment by recycling used Fluorescent Lamps and High Intensity Discharge (HID) Lamps. Many State Regulatory Agencies and the US EPA have regulated these items to reduce the amount mercury in our landfills and ultimately in our environment. In many states, such as Minnesota, regulations mandate recycling these lamps. Click Here for Minnesota Statute 116.92 Other states follow the US EPA guidance for Universal Waste Disposal which makes recycling the best option for disposal. All fluorescent lamps contain mercury. If improperly disposed, mercury can be harmful or deadly for humans. Be sure to ask about packaging and packaging requirements for the safe transport of old lights destined for recycling. We have several good options to allow customers maintain compliance for proper storage and transport of these old lights. Our US DOT Fiber Drums used for Fluorescent Lamps are a good solution for storage and transport. Our Fiber Drums meet or exceed Local, State and Federal storage and transport requirements. 4' Tall Fiber Drums (22" diameter) holds up to 380 - T8 Lamps. 8' Tall Fiber Drums (15" diameter) holds up to 125 - T8 Lamps. 30" Tall Fiber Drums (22" diameter) are perfect for miscellaneous lamps sizes such as compact fluorescent and H.I.D. Lamps. Ballasts are used to convert energy to the precise power needed to power Fluorescent Lamps and High Intensity Discharge Lamps (HID). Prior to 1979 these ballasts were manufactured with Polychlorinated Biphenyls (PCBs) to reduce the amount of heat emitted. PCBs are a carcinogen and can cause cancer. After 1979 manufacturers were no longer allowed to use PCBs for Ballast production. These old ballasts must be disposed of in accordance with strict regulations ensuring proper disposal.Green Lights Recycling has comprehensive practices which ensure proper disposal. When PCBs were banned in 1979, one of the most commonly used chemicals to replace them in ballast capacitors was di (2-ethylhexyl) phthalate or DEHP. DEHP is found in F40 ballasts manufactured between 1979 and 1985, and in F96 ballasts manufactured between 1979 and 1991.Although probably less toxic to humans and the environment than PCBs, DEHP is a probable human carcinogen. As a result, it is regulated by a variety of environmental laws. Under Superfund laws, comprehensive environmental resource conservation liability act (CERCLA), DEHP is a listed hazardous substance. If a person disposes of DEHP ballasts in a landfill and this causes DEHP contamination, then the person involved may be liable for the clean-up of DEHP in the future. Recycling costs for DEHP ballasts are the same as for PCB ballasts.We recommend DEHP ballasts be handled in the same manner as PCB ballasts to avoid potential Superfund liability. More recently, electronic ballasts have been widely used.Green Lights Recycling follows regulatory guidelines for proper recycling of these units too. For example, in Minnesota the Electronic Ballasts are regulated under the same legislation as computers and electronics for disposal and are recycled accordingly. Batteries contain toxic chemicals and heavy metals, including mercury and lead, which can cause life-threatening diseases and birth defects. Children and pregnant women are most at risk from these potent neurotoxins. More than 3 billion batteries are sold annually in the U.S. alone, and batteries contribute 88% of the mercury present in municipal waste. In 2010, about 7.1 million pounds of rechargeable batteries were collected for post-consumer recycling, 11% less than the 8 million pounds collected in 2009. Living far from a landfill doesn’t mean you’re safe. Heavy metals can become airborne if incinerated, can leach into water supplies if buried or abandoned, and do poison our food chain. For example, as larger fish eat smaller fish, the toxins in their bodies become more concentrated.The more we each do to stop the spread of toxic materials, the healthier we’ll all be. Green Lights Recycling knowledgeable staff can help you implement a new battery recycling program or streamline an existing program to ensure a higher recycling rate. We can also provide information and assistance for transporting large quantities of batteries in accordance with the U.S. DOT's Pipeline and Hazardous Materials Safety Administration (PHMSA) requirements. Did you know that standard "consumer" batteries, generated by small quantity or facilities with generator status are considered hazardous waste and must be managed properly? Most "household" and some industrial batteries fail the toxicity test (TCLP) for mercury, silver, lead, and chromium based on type and manufacturer. Zinc, and/or copper are regulated in some states. Batteries, when disposed, must meet the specified treatment standards under the land disposal restrictions and some batteries (i.e., nickel- cadmium, lead acid, and mercury) have specified technologies under federal and state regulatory requirements. Reclamation of usable materials from batteries is an economical and environmentally sound decision. Recycling can reduce the risk of future financial liability associated with land disposal. Additionally, battery recycling gives a generator credit for waste minimization at an effective price. Batteries require cool, well ventilated, dry storage areas. Protect batteries against being damaged, crushed, punctured or short-circuited. Do not smoke or eat in battery storage areas. Store batteries separately from other hazardous material. Tape terminal-ends securely with non-conductive tape to prevent short-circuiting. Mercury is a naturally occurring element that is used in numerous everyday items used in a host of various applications. It has unique characteristics that make it the best option for manufacture of items such as Fluorescent Lamps and High Intensity Discharge (HID) Lamps. Mercury has been used in the manufacture of many devices such as thermostats, switches, medical devices and so on. Green Lights Recycling specializes in recycling Mercury and Mercury Containing Devices. We have successfully assisted a wide variety of customers to eliminate usage of old mercury containing devices and replacement of the items with mercury free replacement products. From 2007 through 2009, The Minnesota Pollution Control Agency (MPCA) contracted Green Lights Recycling to administer a program called The Mercury-Free Zone to remove Mercury and Mercury Containing Devices from Minnesota's Schools. The result was impressive: Almost half of the mercury in Minnesota schools was removed through the Mercury-Free Zone Program. What did the Mercury-Free Zone Program accomplish? Raised awareness of the dangers presented by mercury in schools, which may have facilitated passage of the law banning mercury in Minnesota schools. Altogether, more than one ton of the estimated 2.2 tons of mercury in Minnesota schools was removed and recycled through the MPCA’s Mercury-Free Zone Program. From 2001 to 2009, 856 Minnesota schools pledged to be mercury-free, 335 schools were assessed, and more than 50,000 students and teachers were educated about the dangers of mercury. In addition, 262 schools participated in the Get the Mercury Out Now! Effort, resulting in the removal and recycling of about 370 pounds of mercury. (Source: Minnesota Pollution Control Agency Website for Mercury-Free Zone success Data). We are confident we can help you too. Businesses and Consumers can achieve substantial savings when upgrading to modern, energy efficient appliances. Many old appliances and some newer appliances contain components that need to be properly disposed of when removed from service. What are the Dangers of Used Oil, Mercury, and PCBs? If improperly disposed, used oil from refrigerated appliances can result in the release of dissolved ODS refrigerant and groundwater contamination. In addition, short-term exposure to used oil can cause skin, eye, and respiratory irritation; in the long-term, it can cause cancer and damage to the liver, brain, immune system, and reproductive system. When released to the environment, mercury accumulates in the tissues of plants and animals and, when consumed by humans, impairs neurological development and causes other problems associated with the nervous system. PCBs are toxic substances with carcinogenic and non-cancerous effects on humans, including effects on the immune system, reproductive system, nervous system, and endocrine system. Additionally, The US EPA imposes fines for improper disposal. Hydro-fluorocarbon (HFFCs) are a big concern. HCFCs in old refrigerated appliances (air conditioners, refrigerators, freezers, etc.) must be recovered according to federal law. The EPA can impose fines up to $25,000 for failure to comply with this regulation. (Source: US EPA Website for Safe Appliance Disposal) Appliance owners play a critical role in helping to protect against environmental hazards associated with appliance disposal. The average lifespan of a mattress is about ten years. In a single year, 20 million mattresses are discarded in the United States alone and most go directly to a landfill. Green Lights Recycling recycles mattresses and box springs and diverts them from landfills. Mattress - Recycling: Dry mattresses, free of mold or pathogens and box springs are accepted for recycling. Sleeper sofas are not recyclable at this time. What are mattresses recycled into? It is estimated that 82 percent of a mattress can be recycled. Recyclable materials include: 30 percent metal, 38 percent cotton, 10 percent foam, and 4 percent wool shoddy. The remaining 18 percent is synthetic materials that cannot be recycled at this time. Once disassembled and sorted, all recyclable materials are sold to make new products. The metal (usually steel) will be melted down and made into new steel products. Recovered fiber is made into automotive stuffing and other textile applications, and recovered foam can be used in insulation or carpet underlayment. Lastly, the wood frames are typically chipped and burned as fuel. The easiest way to recycle your used carpet is to contact Green Lights Recycling. For the recycling of Post-Consumer Carpet and Pad it must meet the following requirements: Must be dry, no wet carpet or pad, Rolled residential carpet accepted, Commercial carpet accepted only with prior approval' Maximum 6 feet for width of carpet in rolls' Rolls should be tied with duct tape' Separated urethane foam padding accepted, No rubber backed carpet or rubber pad, No carpet tile or other rigid flooring, No carpet scraps or trimmings, No tack strips, nails, staples or knife blades, No wet glue, debris, refuse, rocks or caked mud, Minimal loose dirt, Absolutely no co-mingled refuse accepted. Drop off carpet and pad any time at Green Lights Recycling. Carpet and pad from individuals, carpet installers or registered refuse haulers can be delivered to Green Lights Recycling. 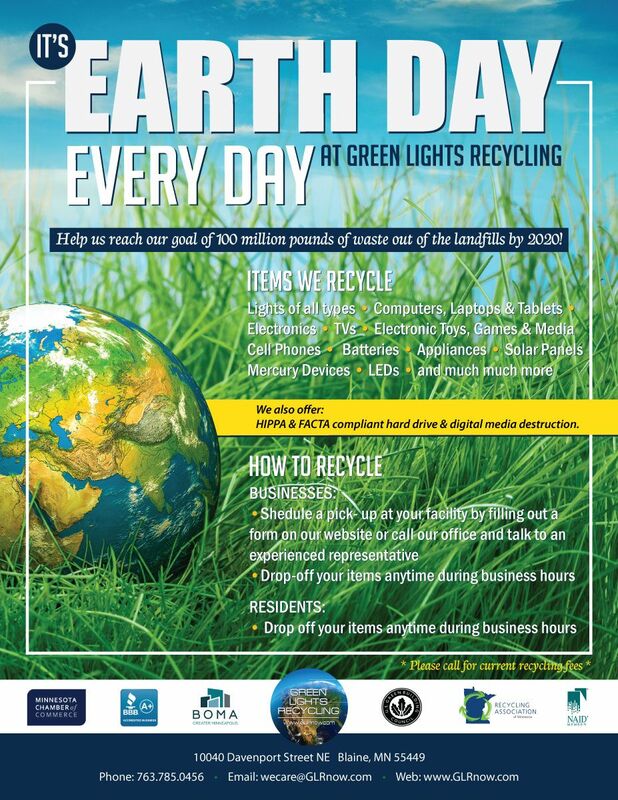 For special collections or transportation of large and regular quantities please contact Green Lights Recycling for information on alternative collection methods. There is a drop-off charge for carpet or pad delivered to Green Lights Recycling within the stated specifications. Collaboration between Armstrong and Green Lights Recycling Significantly Expands Opportunity to Recycle Old Ceiling Tiles. The Armstrong Ceiling Recycling Program is an easy way for businesses like Microsoft, Pfizer, Nike, and General Motors to help save the environment. Since 1999, the nation’s first ceiling recycling program has diverted over 77,500 tons of ceilings from landfills. Those old ceiling panels are used to manufacture new Ceiling-2-Ceiling™ panels. Keep used ceilings out of landfills; recycle them and be part of “Save The Ceilings”. Recycling old ceiling systems contribute to LEED® credits. Please contact Green Lights Recycling for how-to information and preparation assistance.